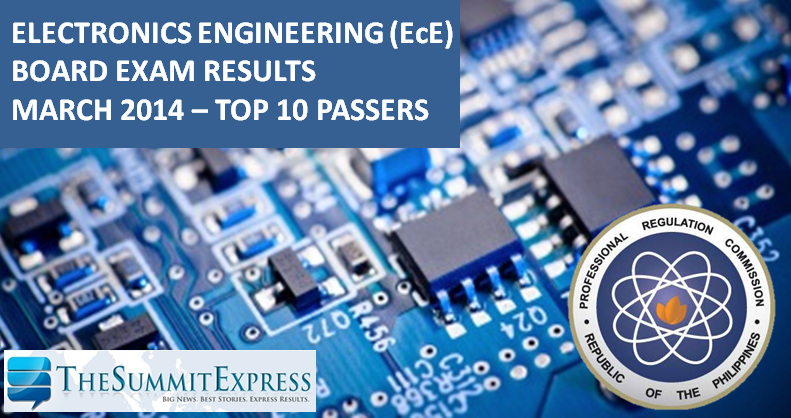 The Professional Regulation Commission (PRC) and the Board of Electronics Engineering released on Friday, March 7, 2014 the full list of passers for March 2014 Electronics Engineering (ECE) and Electronics Technician (ECT) board exam. Emanuel Seguiran Gabriel, a graduate of Polytechnic University of the Philippines - Maragondon topped the ECE board with 86.70 percent grade. University of Santo Tomas alum Justin Spencer de Leon Mamaradlo ranked second with 85.70 percent grade. Meanwhile, the PRC only announced four (4) highest places for March 2014 Electronics Technician (ECT) board exam.